Dina's Place v Santorini, Řecko: Zarezervujte nyní! 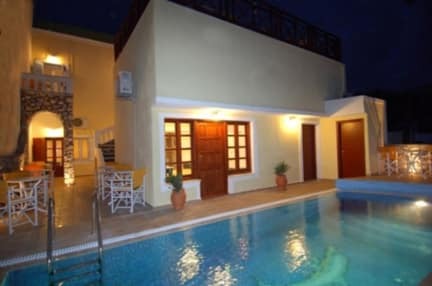 Dina's Place in Santorini combines reasonable rates, a friendly atmosphere and a really good location to jump start your holiday. Dina's Place is situated in a quiet area in Fira Town, Santorini Island's capital near the main bus terminal and Fira's main square. Make your way up through the picturesque back streets and discover all that Santorini has to offer - traditional tavernas, little shops, the intense nightlife scene, the Caldera & the Volcano. Or have a quick dip in our swimming pool equipped with sunbeds & umbrellas - a great way to start the day. The rooms for 1 to 4 persons are newly renovated with a minimalistic design. 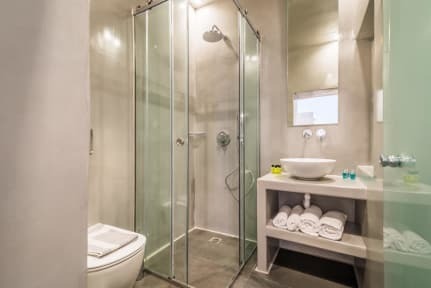 Each room provides a private bathroom, a balcony or veranda, fridge, air conditioning & heating, TV, safe box and a hairdryer.